Click on Images to enlarge and view in lightbox. About Myself: I grew up in Las Vegas, the 4th of 7 children. I moved to Texas in 1984. I have a BSBA and MBA in Finance and I am a Certified Management Accountant, Certified Internal Auditor, and Certified Fraud Examiner. I’ve managed Finance and Audit departments and worked as an independent consultant in the public and private sectors. I love to travel to historic and cultural sites and for tennis. I’ve traveled to every continent except Antarctica and 14 tennis grand slams: Wimbledon (1), Australian Open (1), French Open (3), and US Open (9). I have 3 dogs: Calamity Jane (18), Cat Ballou (7), and Kid Shelleen (4) - my little band of outlaws. You may not know: I built my home with a room dedicated to my Steinway grand piano. I hope to eventually play well enough to enter the Van Cliburn Amateur competition in Fort Worth. There’s no upper age limit so I have time. Favorite MN activity: Learning about plants, trees and gardening. I’ve never been good with plants but since becoming a MN, joining NPSOT and working at SM Discovery Center, Westcave Preserve, Balcones Canyonland Preserve and LBJ Wildflower Center, I have planted a madrone, 2 shumard oaks, an escarpment cherry and numerous plants and grasses and they’re thriving. About Myself: I moved to Austin with my husband from Arizona in 2002 and we were only supposed to be here for a year before moving back to our home state of Florida. That one year has now become nearly two decades and I can't imagine living anywhere else. We now live in Hays county. I joined the Master Naturalists (2018 Foxes Class) in order to help preserve our precious central Texas natural history and resources. I especially hope to educate and plant the seeds of appreciation of the natural world in children and young people. I was lucky to be surrounded by parents, grandparents, and uncles whose love of the natural world and environmental awareness helped shape my own interests as a child. You May Not Know: I am an avid reader and have been collecting pre-Victorian, Victorian, and post-Victorian ghost stories and supernatural fiction, British golden-era mysteries, the works of Tolkien, and folklore for over 20 years. I also love to hang out with my best buddy Merlin, a Jack Russell Terrier who unexpectedly joined our family during a camping trip in the Davis Mountains. Fav Master Naturalist Activity: This is such a hard one. 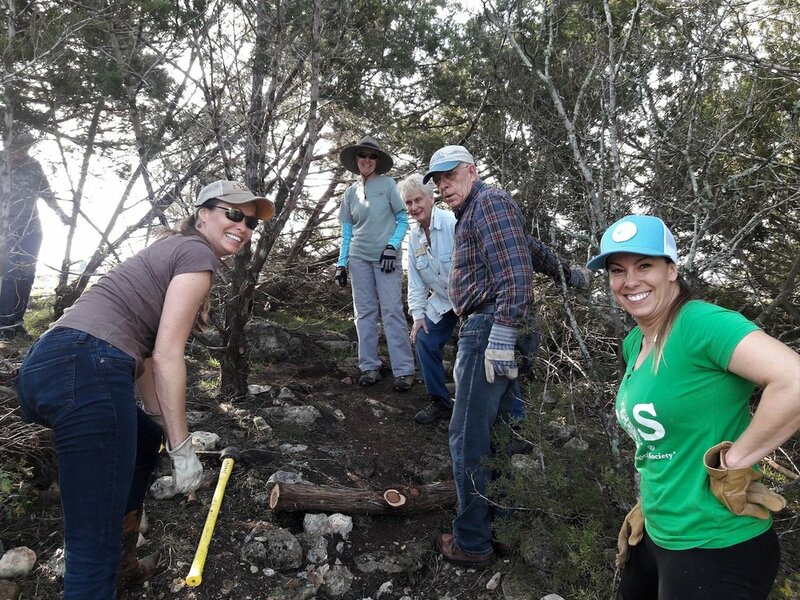 I love to volunteer with children and am so lucky to be able to do so at Wild Basin guiding hikes, at Family Fun Days at Jacobs Well, and now with Wimberley Outdoor Educators. I also treasure the time spent with other Master Naturalists no matter what we're doing. I always learn so much and it's so much fun to be around people who are so passionate about the birds overhead or each plant we come across. Bird I Most Identify With: The bobwhite quail because I seem to always find myself leading a line of chicks, I mean children. One of my earliest memories of any bird is of coming across a mother bobwhite and her line of babies in our pasture. One became separated from the rest and my mother gently picked it up and let me look at it closely. I can remember thinking it was the most delicate, magical thing I had ever seen. When she released it, it dashed to its mother who was waiting at the edge of a clump of grass. I still catch myself looking for quail in any field or pasture to this day. It would be rare to see Eva without a camera in tow. She performs her HCMN volunteer work with a camera slung over her shoulder so she can respond quickly to emerging opportunities to get the next picture. Eva Frost has enjoyed all things nature since she was a young child. She certified with the HCMN Class of Monarchs in 2014, during which time she became an avid birder and took up photography. She studies her subjects thoroughly, often through the lens of a camera and aided by the sharp detail of her photographs. Eva routinely contributes photos to the newsletter. In October 2018, she researched and developed an article called “Dragonflies…On The Fly”. It’s a detailed study about the life cycle of dragonflies and contains a collection of her colorful, stunning macro shots of dragonflies. Check it out here: https://haysmn.org/eva-frost-dragonlyon-the-fly_oct18. The following is a conversation I had with Eva. Her responses are indented below my questions in bold. Could you tell us a little bit about your camera equipment and your field routine? I don’t have fancy equipment. I still use my Canon EOS Rebel with telephoto zoom 55-250mm native lens and image stabilizer, but my go-to camera now is the Canon PowerShot SX60 HS with wifi and smart shutter. I used it for all the photos I shared for this article. The PowerShot SX60 has a 65x optical zoom wide-angle lens with optical image stabilizer, effectively providing a zoom range of 21-1365mm. I sometimes use a sports setting that captures subjects in motion, and I mostly use smart shutter. It works well in sunshine situations and shows great detail. I try to head to a favorite hiking area - Pedernales, San Marcos, Kyle, Johnson City, Hamilton Pool, Reimer Ranch, or Westcave Discovery Center. If I can’t do that, I shoot from work, which is on private property with all habitats available - prairie, riperian with a pond and stream, woodlands, and canyon tops. Every day, twice a day, I go out. When I see a bird (or any wildlife), as soon as I can, I take a quick shot for identification purposes and in case the subject gets away. Then I try to shoot the subject at many angles and different backgrounds. I watch for behaviors, keeping an eye out for habits or make tick noises to get their attention. I try to get a good background with color and frame the subject. One time I put my camera in a hole to get the background I wanted. The camera does the focusing. How do you capture spontaneous moments? How do you anticipate an unexpected opportunity? One time I came out of HEB and there was a huge flock of pelicans and I didn’t have my camera. Now I take it everywhere. If I see something moving, like butterflies landing in the yard or on flowers, I zoom in and take the picture. I look for movement. Sometimes I “flush and chase” the subject. I had bluebirds today on the house and I heard them calling, so I also listen for opportunities. Would you describe how you manage and process your photos? I keep all my original photographs on the SD card. I copy the best shots into a “Work in Progress” file and date it. For example, WIP 02-19. From there I go through and identify them, edit them in Windows 10 photo app, and copy them to separate files such as “Best Birds 2019”, “Best Copies”, and “Card Inventory 2019”. Then I re-size and sign the photos for publication on my Facebook page or in Facebook groups. All files are then backed up on a thumb drive. Do you print your photos? What kind of media have you used? Sometimes I make prints myself (8x10, 5x7, 4x6). I’ve printed on canvas or metal using Bay Photo’s online service, and I’ve also used Holland Photo in Austin. Approaching end of day in mid-January 2019, Eva spotted these two hawks perched perfectly on the Scales of Justice. What are your favorite ways to share or display your pictures? I have a Facebook page - Evazeye Photography and Flickr - evazeye2013. I print 4x6 photos to make 5x7 note cards. Can you share a story about a photo opportunity that was especially exciting or rewarding? I get so excited when I see something new. Finding the Alligator Lizard and getting the video of it was very exciting. And getting to see it in the newsletter was also very rewarding. Has being a Master Naturalist changed or influenced your approach to photography? Yes, I feel closer to birds and I use my photography to study them. The rewards of being a Master Naturalist include having access to a lot of people with common interests and working as a team to meet the end goal. Using photography has been a vehicle for me to teach people about all areas of nature so they can be, and will want to be, good stewards of our natural world. Could you share a tip or two and give us your best advice for a beginning hobbyist? Shoot pictures of things you like and take LOTS of pictures. Don’t get discouraged, it gets easier and better with practice. Use a fence post as a tripod or flip a walking stick upside down for a monopod. Eva’s not much into selfies, but she really wanted to take a picture of this moth, which was quite attached to her. Beginning April 1, 2019, the 15th Annual Naturescapes Photography Contest and Exhibition is open to residents and visiting photographers of all ages.The contest includes photographs taken in greenspaces and natural areas throughout Hays, Blanco, Coma, Guadalupe, Caldwell, and Travis Counties. Goals of the contest and exhibit include increasing public awareness of the importance of protecting our natural world and giving photographers at all levels of experience a chance to capture, share, and receive recognition for beautiful and inspiring images. Suggested subjects include natural scenery, wildlife, plants, and people and pets in the natural environment. The Hays County Master Naturalist Chapter is sponsoring an award for the best photo of a natural waterscape. This was the start of the geology walk portion of the Site Visit. The HCMN class of 2019 had our first site visit at Jacob’s Well Natural Area (JWNA), a place famous for its iconic swimming hole but offering so much more for the nature lover. Our group split up and took turns in the classroom with Quincy Kennedy, education coordinator at JWNA, sharing a presentation on the history and unique geology of the Jacob’s Well area. We learned about the tectonic events that formed the Edwards Plateau and the Balcones escarpment from what was once a shallow sea. We reviewed the origins of karst and the source of the fossilized clams and other sea life that compose our rocky limestone soils of the Texas Hill Country. Quincy gave us some great resources about the fissures, sinkholes, and springs that are a result of amazing geologic forces still molding our landscape today. Note the green moss growing where the water exits the rock. After our classroom time, we joined Tom Jones, Master Naturalist and hydro-geologist to visit the site of Jacob’s Well and the Cypress Creek watershed nearby. We walked along the creek bed, which Tom explained is 65% dry but conceals an enormous volume of water not far below. We examined the cliff walls that clearly show layers of limestone washed away by rainfall, revealing large fissures that replenish the Cow Creek, Edwards, and Trinity aquifers. Tom showed us several springs where water seeps from the porous rock, creating areas covered with moss and newborn stalactites. The group stopped for a while to look down at Jacob’s Well and discuss the special characteristics of this tunnel-like cave with an average depth of 120 feet. It is the 2nd largest underwater cave in Texas and is regularly explored by a specially-trained SCUBA team known as the Jacob's Well Exploration Project who have measured and mapped the extent of the tunnels. This site visit was very educational and interesting, and we were fortunate to have several very knowledgeable master naturalists with us to discuss the importance of this natural area and its impacts on the surrounding communities. It’s always a pleasure to visit places that show how excellent stewardship can allow visitors to enjoy and learn about nature while preserving as much of the environment as possible. Jacob’s Well is an excellent example of such stewardship. For more information about JWNA, consult their website at http://www.co.hays.tx.us/jwna.aspx. Fossil Ammonite impression in limestone along Dry Cypress Creek upstream from Jacob's Well. Editors Note: Constance Quigley & Jeff Crittenden are the 2019 Training Class reporters. Tom and Betsy welcome them to the Newsletter Team. About Jacobs Well Natural Area: Jacob’s Well Natural Area consists of five land surveys that all use the spring as a corner to tie the properties together. These surveys were conducted in 1847 by a prominent surveyor names Bartlett Sims. In the early 1850’s William C. Winters, a San Jacinto veteran and early settler of Wimberley, hiked up Cypress Creek searching for its source and found an overflowing spring. It is said that Mr. Winters exclaimed “like unto a well in Bible times.” Thus it was named ‘Jacob’s Well’. The property changed hands many times over the next 100 years and became a popular recreational destination. Jacob’s Well Natural Area remains a popular recreational destination today. Link to their website with additional information. Goodwill donations are greatly appreciated to cover our food costs. Congratulations to the 29 members of the Class of 2018 (the Foxes) who completed their Initial Certification by the end of the reporting period. Congratulations to the 96 Hays County Master Naturalists who completed their 2018 Re- certification by the end of the reporting period. Just in time for Butterfly Day this year is the opening of a new “Pollinator Garden” immediately adjacent to the greenhouse at Emily Ann. It’s meant to be more than a bunch of pretty flowers though. Hopefully, it will inspire people who are interested to copy design elements they like into their own landscapes. The best pollinators will be highlighted, with signage giving a 4- or 5-star rating to that particular plant based on its value to butterflies and hummingbirds. There will be a picture of the plant in bloom, its height, bloom time, place of origin, and any interesting characteristics. The garden design (DIY Landscaping) insures color, both spring and fall. Come by and take a look this Butterfly Day (April 27). Just remember, this will be the plants’ first year. Garden adage: first year they sleep; second year they creep; third year they leap. The Wimberley Outdoor Educator Team hosted the Jacob’s Well Elementary School 3rd Grade field trip to the Patsy Glenn Refuge. 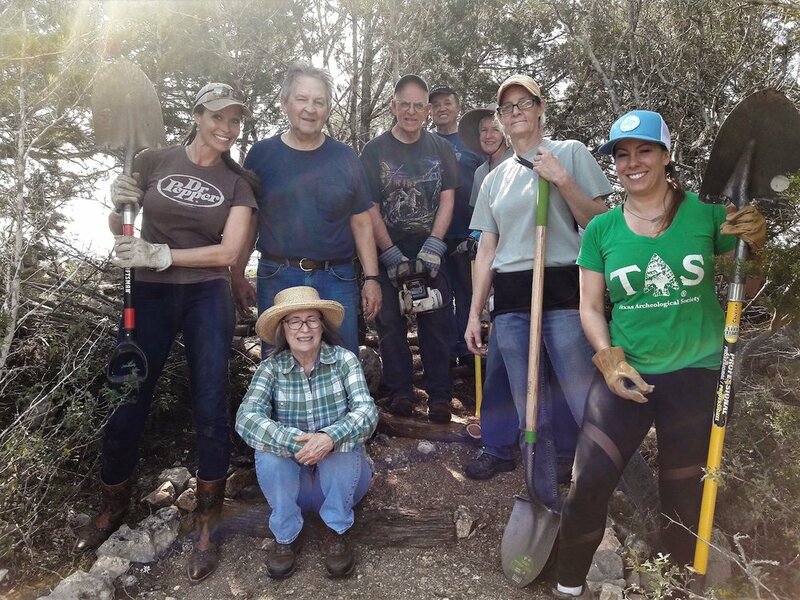 The refuge is located on what was considered 1.8 acres of surplus property behind the Wimberley Community Center and has become a haven for wildlife and native plants. The MN team led by Jackie Mattice hosted over 150 students throughout the day using a rotation of four education stations. This was a fun and educational day for students, teachers, and Master Naturalists. Bird Nesting at the Kiosk - Presentation on nesting materials, nest building and bird behavior. Bird Nesting at the Kiosk - Introducing Students on activity to demonstrate that not all eggs make it to hatching because of predation. Bird Blind Station - learning how to identify birds in the Bird Blind. Bird Blind Station - Students observing birds on the feeders. Binocular Station -putting their lessons on binoculars to use. Binocular Station - demonstrating the care of binoculars, Dos & Don’ts. Bird Habitat Station - presenting information to Students on bird adaptations and food sources. Bird Habitat Station - teaching bird habitat and adaptations at the Meadow. Patsy Glenn's vision to create a nature refuge and bird sanctuary in the heart of Wimberley became a reality near the end of her life. The Patsy Glenn Refuge is a place where children and adults alike can enjoy the natural beauty of the area and learn to respect and love birds, flowers, and other native wonders. The Wimberley Birding Society named Patsy Glenn the first recipient of the Golden Eagle Award in 2002. The project once named "The Refuge" was renamed "The Patsy Glenn Refuge" in honor of her commitment and dedication. Twenty-two educators received a delightful Flying WILD Training Workshop led by Tom and Patsy Inglet, who drove to Jacob’s Well from Cibolo Nature Center for this rare occasion. The 6-hour training session entitled the participants to receive their Flying WILD Educator Certification. The workshop was fast-paced; the momentum never stopped. They worked right through lunch while sharing ideas. First came “Bird Banding” and “Why Focus on Birds?”, leading off with the importance of birds aesthetically, scientifically, economically and ecologically. By mid-morning all became Bird Detectives using clues to identify birds and explore bird behavior coupled with a Scavenger Hunt. The afternoon topics and activities had them up on our toes with a Physical Activity: Avian Antics/ Bird Behavior, followed by activity demonstrations on Science/ Social Perspective of the hazards and challenges birds face daily, and the geography of Migratory Mapping. The class ended with Service Learning Resources about being a Citizen Scientist. Tom and Patsy’s timing and interacting was flawless. There was obvious joy and laughter that spilled out into the garden stirring the curiosity of passersby. By day’s end, the educators were already plotting how they would apply this new information to their outreach programs. Flying WILD is a program which helps educators develop other people into citizens concerned about birds and other elements of nature by engaging in real-world learning. Participants learn about breeding ground, wintering ground, migration route, and stopover point; all while describing common hazards to migratory birds and learning the importance of bird banding. A team of two participants tries to reach the end of their migratory path by moving through a series of stations that present obstacles such as powerlines, jets, and bad weather. Will you make it safely to your wintering grounds? In this hilarious game of charades, participants discover the diversity and importance of courtship rituals for birds who are seeking mates. Each species of bird has evolved with a unique set of displays - a set of behaviors that function like language to communicate emotions or intentions. Communication towers, cars, outdoor cats, birdfeeders, edible berries, and a plate-glass window. For a bird, which of these is a friend or foe? For more reliable bird identification be scientific: PLAY CHESS BACKWARD!